We're with our little Superfish, all the way! See your child’s ‘journey’ with their swimming development. Now qualifying to participate in our SQUAD PROGRAMS – Pre Squad Programs- Squad 4 (S4) and Squad 5 (S5) and Senior Squads (SS). 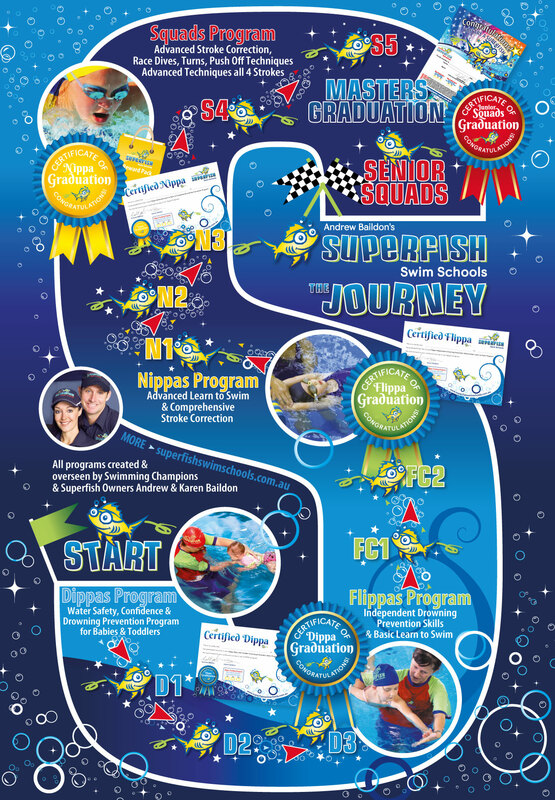 Our SUPERFISH GRADUATION is awarded when your child meets all the criteria to complete our program and have attained an advanced swimming ability. All swimmers are given Level Certificates, for each level they graduate, PLUS a ‘Journey Board’ Poster to take home, with additional certificates and stickers along the progression.